The 2 minutes silence traditionally follows the playing of the last post on a trumpet or the repeating of the “Ode of Remembrance” the world over – but did you know that it was conceived by a South African? In the four days between 15 and 19 July 1916 during the Battle of Delville Wood, the South African Brigade, numbering 3,150 men suffered some 2,500 casualties in which the dead outnumbered the wounded four to one. The battle was of such a ferocity that German artillery fire directed on the South African positions reached a rate of 400 shells per minute. When the first casualty lists recording the horrific loss of life in engagements including the Battle of Delville Wood were announced in Cape Town, Mr J A Eagar, a Cape Town businessman, suggested to the congregation of the church he attended that they should observe a special silent pause to remember the South Africans on that casualty list. One of the City Councillors, a Mr R R Brydon, whose son Major Walter Brydon was killed in action on 12 April 1918, wrote a letter to the Editor of the Cape Times suggesting that the period of silence be initiated to remember the casualties. 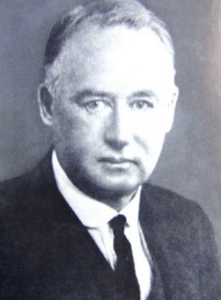 In May 1918, the Mayor of Cape Town, Councillor Sir Harry Hands – whose son, Captain Richard Hands, serving as a member of ‘Brydon’s Battery’ had been mortally wounded in the same battle in which Maj Brydon had been killed – reacted positively to this suggestion and initiated a plan to have a daily period of silence of 3 minutes that would follow the ring of the noon gun on Signal Hill, the most audible signal across the city. For the first time, the boom of the noon gun was the signal for Cape Town as a city to obey the request of their Mayor and stop whatever it was that they were doing, bow their heads and mourn those who had given their lives in the fighting on the Western Front in France. The citizens of Cape Town also reacted extremely positively to this request and Cape Town came to a halt as everyone and everything came to a dead stop while the citizens bowed their heads in a silent prayer for those in the trenches in Flanders. As soon as the city fell silent, melancholy strains reverberated through the city as a trumpeter, standing on the balcony of the Fletcher and Cartwright’s Building at the corner of Adderley and Darling Streets, sounded the Last Post. There was then silence for three minutes after which the trumpeter sounded Reveille, and the City returned to its normal noisy flow of vehicles and people. The result of the Mayor’s appeal had exceeded all his expectations. The following morning articles about the event appeared in all the newspapers describing how trams, taxis and private vehicles all came to a stop whilst pedestrians came to a halt and most men bared their heads. People who were at work stopped what they were doing at their places of work and sat or stood silently. One journalist described a young woman dressed in black, who came to a halt on the pavement and furtively dabbed at her eyes with a handkerchief and commented: “One could not but wonder what personal interest she had in the act of remembrance”. A few days later the Mayor decided to shorten the duration of the pause from three to two minutes, “in order to better retain its hold on the people” and this is the timing that has continued to be used down the decades that have followed. 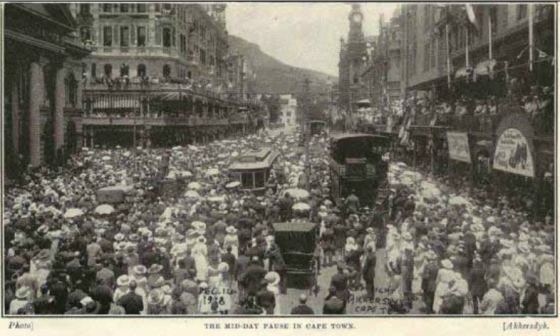 The midday pause continued to be observed daily in Cape Town until the 17th of January 1919 when it was observed for the last time, however it was revived in Cape Town during the Second World War. This was also driven from Cape Town. Sir Percy Fitzpatrick had been impressed by the period of silence, especially as he had a personal interest in the daily remembrance in that his son, Maj Nugent Fitzpatrick, the battery commander of 71st Siege Battery, had been killed on 14 December 1917 by a chance shell fired at long range. Sir Percy was understandably deeply affected by the loss of his son and was also so moved by the dignity and effectiveness of the two minute pause in Cape Town that the date and time of the Armistice inspired him to suggest an annual commemoration on an Empire wide basis. He suggested this idea to Lord Northcliffe, a British newspaper and publishing magnate of that era, and was disappointed by his lack of support. Nevertheless this did not deter him, so he therefore approached the Colonial Secretary, Lord Milner. Lord Milner received the letter on the 4th November 1919, and the idea was reviewed and accepted by the War Cabinet on the 5th November and immediately approved by King George V.
“Tuesday next November 11, is the first anniversary of the Armistice, which stayed the world carnage of the four preceding years… it is my desire and hope that at the hour when the Armistice came into force, the eleventh hour of the eleventh day of the eleventh month, there may be, for the brief space of two minutes, a complete suspension of all our normal activities. During that time, except in the rare cases where this may be impracticable, all work, all sound and all locomotion should cease, so that, in perfect silence, the thoughts of everyone may be concentrated on reverent remembrance of the Glorious Dead”. Sir Percy was in America on business when he read on 12 November 1919 that the first Two Minute Pause had been observed in England the previous day. I was so stunned by the news that I could not leave the hotel. An hour or two afterwards I received a cable from Lord Long of Wexhall: “Thank you. Walter Long.” Only then did I know that my proposal had reached the King and had been accepted and that the Cabinet knew the source. The Times newspaper reported, “Throughout the British Empire, from the jungles of India to the snows of Alaska, on trains, on ships at sea, in every part of the globe where a few British were gathered together, the Two Minute Pause was observed”. On 30 January 1920, Sir Percy Fitzpatrick received a letter signed by Lord Stamfordham, the King’s Private Secretary. The King, who learns that you are shortly to leave for South Africa, desires me to assure you that he ever gratefully remembers that the idea of the Two Minute Pause on Armistice Day was due to your initiation, a suggestion readily adopted and carried out with heartfelt sympathy throughout the Empire”. The solemn pause of silence has been adopted around the world, regardless of race, religion or culture. It is the greatest mark of respect that anyone can collectively pay to those who lost their lives in defence of their country.